Grab a Second Helping of War! 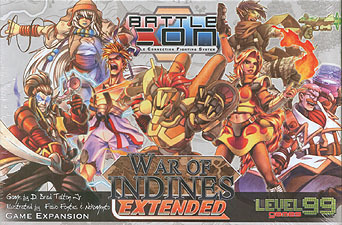 War Extended Edition gives you a vast array of new options to expand and enhance your BattleCON game! 18 Alternate Costumes for your favourite heroes, each with a new Unique Ability. 6 Holiday-themed Alternate Characters with new abilities, previously released only as downloads! 12 Arena Cards to provide new venues for battle and new challenges! 16 Striker Cards to assist you in combat and give you an edge against opponents! This is an Expansion. BattleCON: War is required to play with the components in this box.